Nature And Activity Lovers Rejoice! 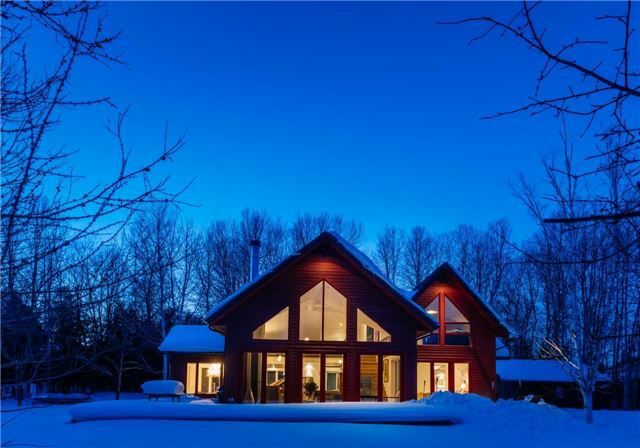 A Gorgeous Chalet Situated On A Secluded Forest Lot Near Collingwood Awaits. This Stunning Urban Chalet Was Completely Renovated & Designed By Studio Pyramid Inc. It's The Perfect Blend Of Chic And Functional Warmth, 15 Ft. Cathedral Windows, Open Concept Design, Fumed Oak Flooring, Rumsford Fireplace, South Facing Lot, Jacuzzi Access Through The Master Bdrm & Lr, S/S Backsplashes, Wolf Range. 21 Buckingham featured in Objekt Magazine, Homes and Cottages, and Nice-Martin magazines.